In the mid-1930s, sci-fi legend Hugo Gernsback predicted that manned flame tanks would one day become a reality. A decade later, Gernsback would revisit his prediction with one important twist—the flame tanks of tomorrow would drive themselves. 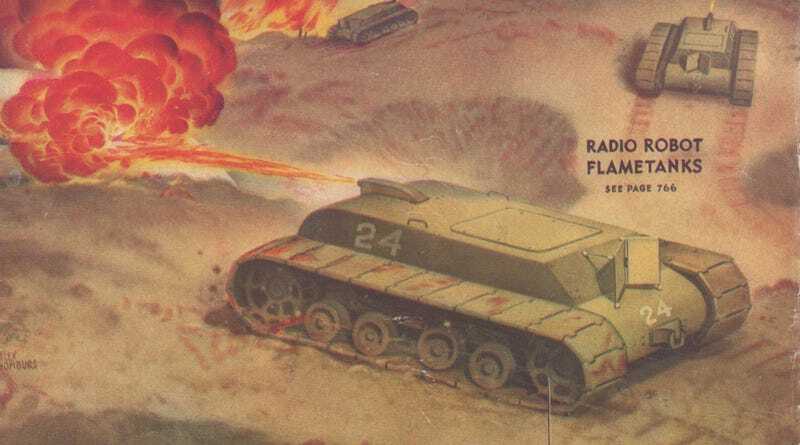 Controlled by wireless signals, the "radio robot flametank" of the future was featured on the cover of the September 1945 issue of Radio-Craft magazine. World War II had effectively come to a close the previous month, but this being the age of deadtree media, the September issue was likely on newsstands before the Japanese even surrendered. In the issue, Gernsback highlighted the most compelling reason to use unmanned vehicles: Not putting your own troops in harm's way. This, of course, still holds true today. During the present war, American and Allied troops have suffered large casualties when operating flame throwers, either the portable type that must be carried on foot, or by flame tank. The reason is that flame throwers have a very short range. The portable flame carrier, or the flame tank, must approach the enemy's stronghold to within one hundred to one hundred fifty feet—often much nearer. This is too close for comfort and if the enemy has hidden snipers or grenades, these can be easily directed on the attacking personnel. For this reason the latter's casualties must always remain high. In the case of a tank, the bazooka type of defense becomes relatively easy to use by the enemy and many tanks are thus put out of action with high casualties. It was actually the Germans who pioneered the use of unmanned mini-tanks in WWII, albeit as sacrificial explosive devices, not flamethrowers. Taking their cues from much more primitive "land torpedoes" in WWI, the Germans developed what was called the Goliath Demolition Vehicle. Controlled by a cable just under a mile long, versions of the Goliath that appeared in 1942 were small (about 5 feet long and 1.5 feet tall) and carried 132 pounds of explosives. About 2,500 of these electric Goliaths were produced during the war, and they were used for both destruction missions and mine-clearing. A gas-powered Goliath was also produced, which could carry 220 pounds of explosives. The Nazis churned out even more of these, deploying about 4,500 by the end of the war. The Germans and their real-life robot tanks had one crucial advantage over Gernsback's fictional flametanks: Their hardwired nature. It's awfully tough to hack a wired system in the middle of a firefight. They are relatively cheap in manufacture and do not require extraordinarily heavy armament, except where they face the enemy. They are safe in operation and cannot be interfered with by the enemy because a directive system of ultra-short waves is used. Reflectors on the back of the tanks are so constructed that only microwaves from the rear can effect their operation. Waves coming from the enemy cannot interfere with or operate these tanks. Outside of domestic spying, the hot button issue of the day seems to be unmanned aerial vehicles, or drones as they're more popularly known in the press. Are drones currently being overused to attack targets too indiscriminately? What will they look like in the coming decade, and how will they be expanded over American airspace? For some reason, though, the popular press seems to be largely ignoring the role of unmanned ground vehicles. With the Congressional mandate that a full third of military vehicles be unmanned by 2015, and the development of experimental humanoid battlebots (which, of course, are only seen as search-and-rescue robots today), there seem to be plenty of hard questions in our immediate future both in the air and on land. Flying robots have already changed the face of war today. How will armed autonomous tanks and machine gun equipped landbots do the same tomorrow? It's a brave new future no matter what—but especially if something as terrifying as Gernsback's radio robot flametank is waiting for us.